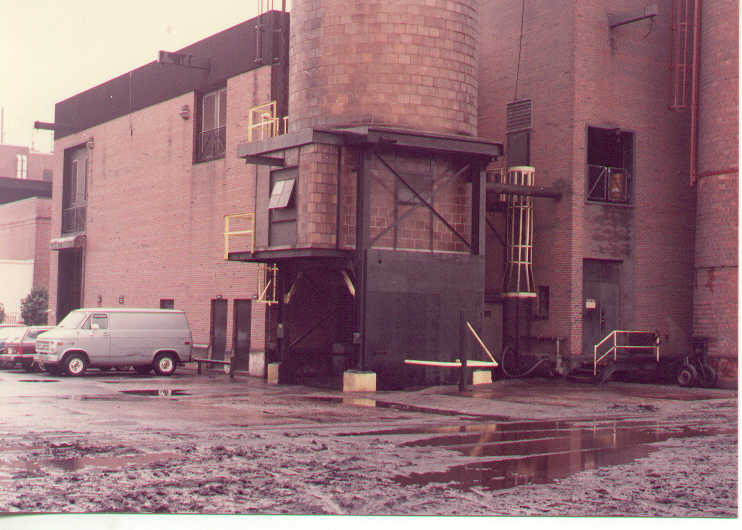 On the following three pages are a series of pictures from 1984 presenting Central Utilities Coal Fired Steam and Chilled Water Plant. Various links on the picture page go on to show different happenings and some of the people at Central Utilities along the way. As the 1990's came to a close the plant was converted to gas, coal was eliminated, and the baghouses removed. But the important role of the plant: to provide heating and cooling, remains unchanged. The future is wide open and new adventures are always on the horizon. Improving on the efficient, clean, economic use of energy is a continuing challenge that is taken on every day by the crew at Central Utilities! Please enjoy this pictorial tribute to the equipment and people that have made up this formidable and reliable power plant, beginning with my earliest involvments. 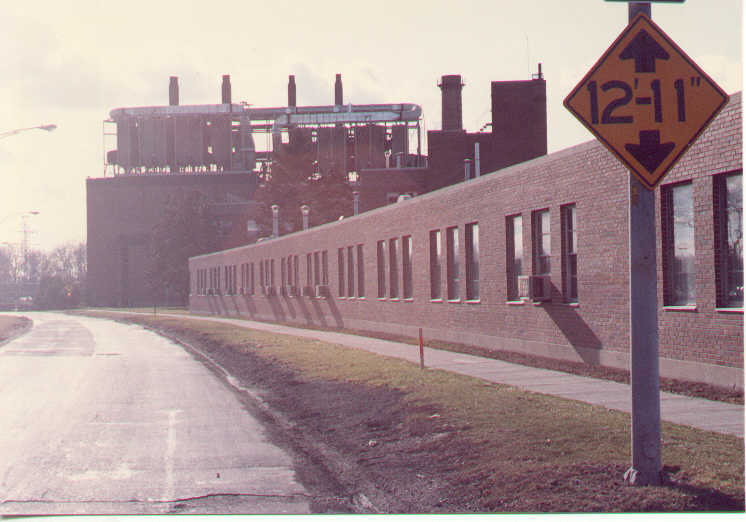 Looking down Elmwood Avenue in Rochester one afternoon in September 1984. the Central Utilities plant stands tall, topped off with the massive structure of two recently installed Fabric Filter Collector systems, more commonly known as baghouses. These were chosen for their highly efficient method of pollution control; their job was to filter particulate matter from the flue gases before it entered the stacks. 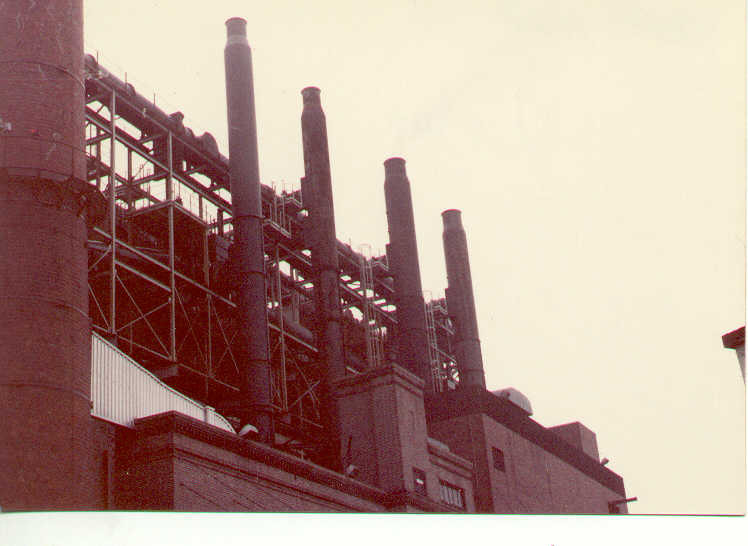 The five Steam Plant boilers are located in the two larger sections of the Central Utilities building, under the baghouses. The heating plant is comprised of two parts. The original 1920's structure, almost hidden at the right rear of the picture below, contains three boilers as well as various pieces of auxilliary equipment. When the plant was expanded in the 1960's that building was extended and heightened, to create room for two more large coal boilers. 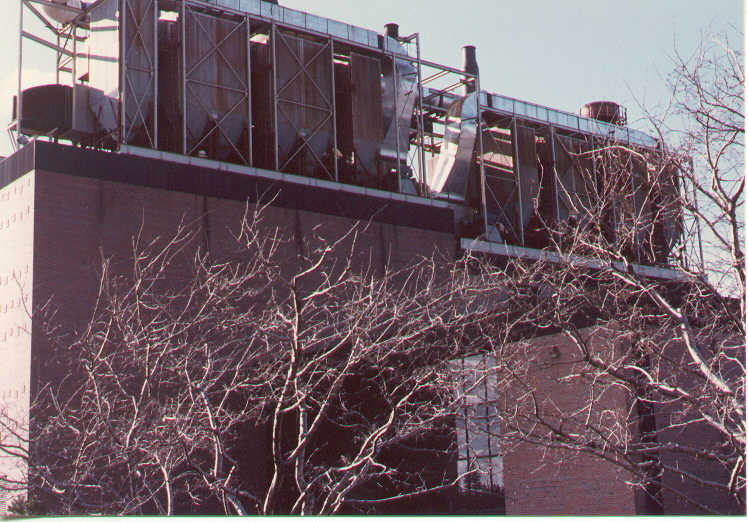 During the same period, a brand new Chilled Water Plant, sporting see-through glass walls on two sides, was constructed, attached to the east side of both the old and new heating plant buildings. 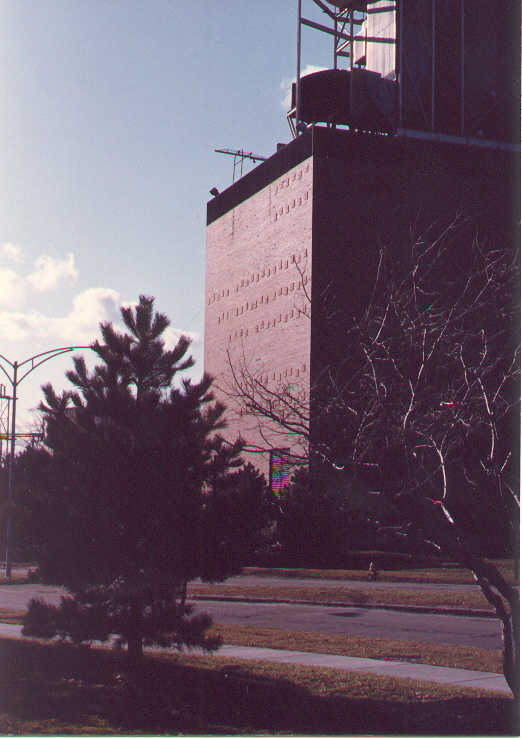 South end of the heating plant. On the roof the inlet manifold curves around from the stacks to the baghouse. Notice the plates holding the brick wall of the heating plant to building steel....apparently the baghouse was kinda heavy and caused the specially built south wall to pull away! Parking spots at the rear showing the ash silo at northwest corner of building, near the center of picture, with the base of the brick stack to far right.. Between the silo and the stack a small stairway and door lead into the air compressor room. The hatchway door above goes onto the mezzanine containing two feedwater heaters, integral equipment of a steam plant. Wet weather and truck traffic always seemed to make a mess of the unpaved area behind the plant. View of the baghouse and stacks from the rear, one boiler per stack. The upper manifold connecting the baghouse outlets to the stacks can be seen clearly. The two stacks to the right are slighty wider to accomodate the larger boilers they exhaust. The grey ductwork at lower left of picture connects a boiler to the brick stack. The picturesque coalyard. Notice the coal train car at rear center, with the car shaker decoupled and suspended from cables above. An adjacent rail line and siding that ran several hundred yards, terminated at the plant, to provide it with a constant supply of fuel. The coal cars were unloaded through two large grates in the ground located beneath the rail lines. Below those grates began a series of conveyor systems. The conveyors distributed the coal to overhead bunkers for short term storage and to ultimately feed the hungry boilers. In later years the rail line and cars would be abandoned and replaced by coal trucks. Eventually the need for coal trucks was eliminated too, when the boilers were converted to natural gas. At the same time, the need for a coal yard ceased to exist. 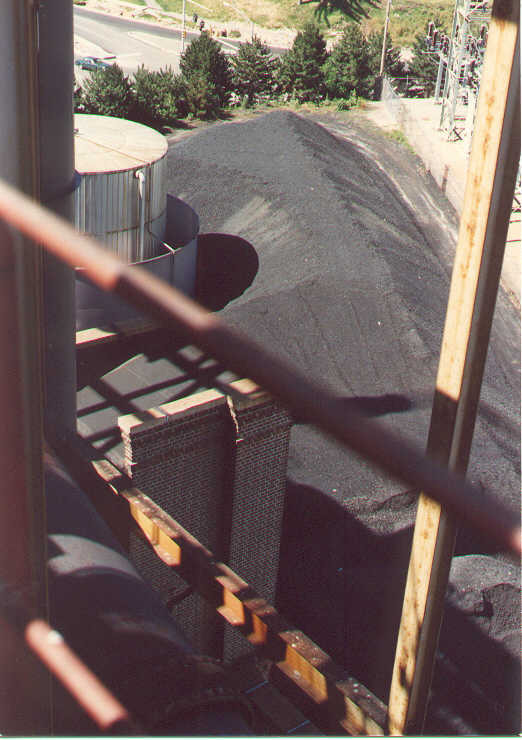 A partial view of the oil tank and coal pile as seen from high above on one of the baghouse catwalks. 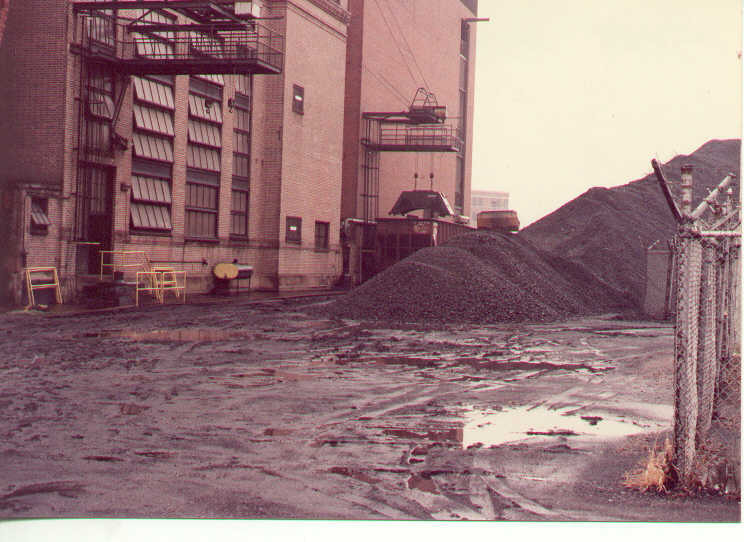 The coal pile was used as a buffer for the sometimes erratic deliveries but more importantly was maintained to provide a fairly large inventory of fuel that could be drawn on in the event of a supply disruption. Oil was considered a secondary fuel. The 200,000 gallon tank can store just about a weeks worth of oil when burned exclusively to make steam.